Looking for Day Trips from Rome? 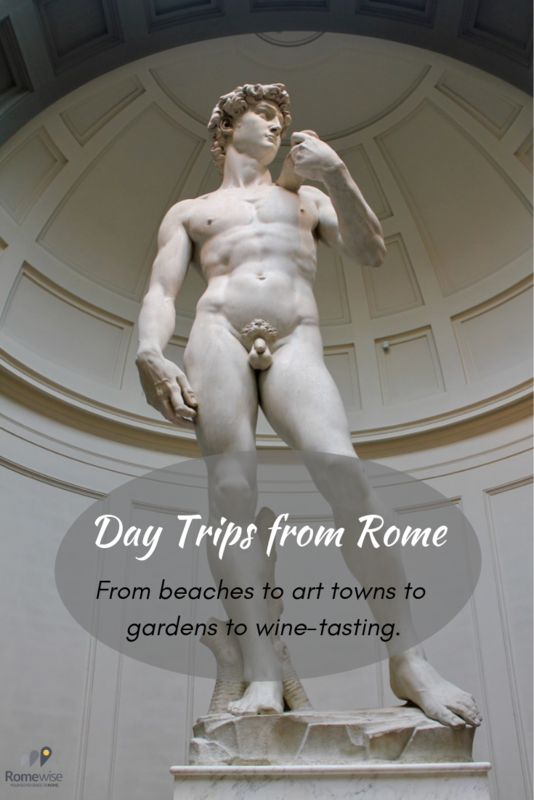 Whether you want to visit Ancient Roman ruins, go wine-tasting, check out beaches, gardens, or other must-see Italian cities, you are spoiled for choice! Day Trips From Rome - Where to Go? We are spoiled for choice when it comes to Ancient Roman ruins inside Rome. But it's also easy to visit some pretty amazing ruins outside the city. These make for excellent day trips from Rome. You can go on your own, or with a tour. I highly recommend taking a tour of any of the below sites. In particular Pompeii and Ostia are vast, and there is so much to see. A good guide can really bring the place to life. Without a doubt, Pompeii is one of the most popular day trips from Rome. In 79 CE, the Roman city of Pompeii was shocked by the devastating eruption of Mount Vesuvius, a volcano that spewed ash, hot lava and gases that plowed through the cities at its base, Pompeii and nearby Herculaneum, with such force and speed that people and animals were literally stopped in their tracks. Today you can visit these cities, with their ancient victims frozen in time. When to go: Year-round, 7 days a week. Closed 1 January, 1 May, 25 December. Open from 8:30am-5:30pm November - March, and from 8:30am - 7:30pm April - October. Tickets: 13€ full price. Free on the first Sunday of each month. Buy your tickets in advance here. Ostia was once one of the most important river ports of Ancient Rome. In the years during and after the decline of the Roman Empire, Ostia fell into disuse and was eventually abandoned. So it does not have the drama of Pompeii. But it is one of the best-preserved ancient Roman cities, and it's only half an hour from Rom, making it one of the easiest day trips from Rome. When to go: Year-round. The site is open Tuesday - Sunday (closed Mondays, December 25, January 1 and May 1.) They ARE open in August and on August 15 (unless it's a Monday.) From 8:30 - var. closing times. Visit the official website of Ostia Antica for more details. How to get there: Take the blue line B metro to Piramide. From there, take the train Roma-Lido, and get off at Ostia Antica. The entrance to the ruins is about 5 minutes' walk from there. 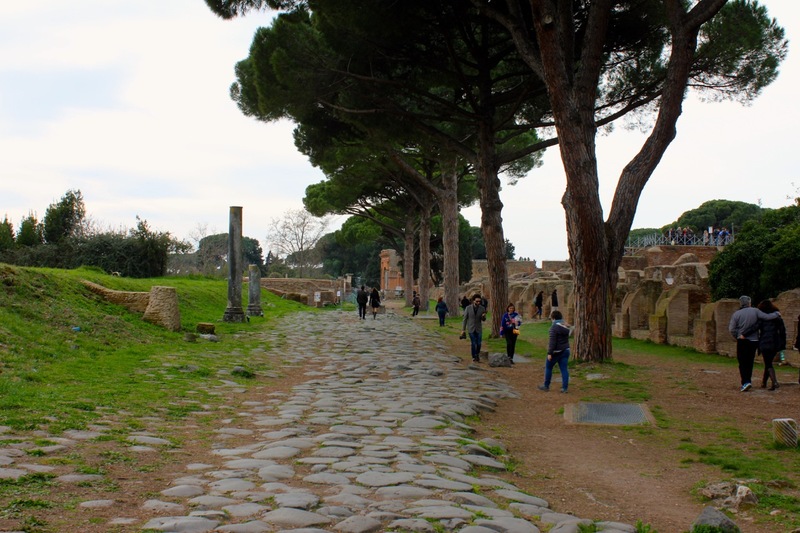 Tours: Click here to book a small-group tour to Ostia Antica ($USD.) Click here to book a small group tour to Ostia Antica in another currency. The site is enormous and there is a lot of ground to cover. It's also not easy to get to on your own. The best suggestion I have for visiting Hadrian's Villa is by car, or with a tour. Tours normally include the Tivoli Gardens in the Villa D'Este (below), also. When to go: The site is open year-round. It's closed on May 1, December 25 and January 1. Opening time is 9am, and closing times vary according to the season. Visit Coopculture for details. How to get there: The best way to get here is by car, or on a tour. If you want to come on your own, Metro blue line B to Ponte Mammolo. From there get a Cotral bus in the direction of Via Prenestina. Ask the driver when to get off. You will still have to walk over a kilometer. Getting back can be complicated, as the bus schedules do not seem to be precise or consistent. Tickets: Full price 8€. Under 18 (everyone) - free. Tours: For an excellent of tours of Hadrian's Villa from Rome, click here ($USD.) Click here for tours in other currencies. When visitors come to Italy, they often want to see more than they have time for. This is understandable. After all, we have more UNESCO heritage sites here than anyplace else in the world! And with limited vacation time, it can sometimes make sense to visit some nearby cities as day trips from Rome, even if they all merit a longer visit. Florence is only 1.5 hours from Rome by train, making it one of the easiest day trips from Rome. Even though Florence offers a wealth of things to see and do, it's also relatively small, compared to Rome, and you can certainly see a lot in one day. When to go: Year-round. Like Rome, Florence will be less crowded (but darker and colder) in low season, i.e. the winter months. And like Rome, Florence swelters in the heat of July and August. How to get there: The fast train is the easiest way to get go round-trip Rome-Florence. Tours: An organized tour is a great way to take the hassle out of planning, and make sure you see the highlights. Click here to see an excellent selection of tours that take you from Rome to Florence and back ($USD.) Or, click here to book a local tour once you are in Florence. (Click here to book a day trip to Florence in another currency.) And, if you just want to book tickets to the Uffizi or Accademia (to see Michelangelo's David), visit Select Italy. Wondering about taking the train from Rome to Florence? 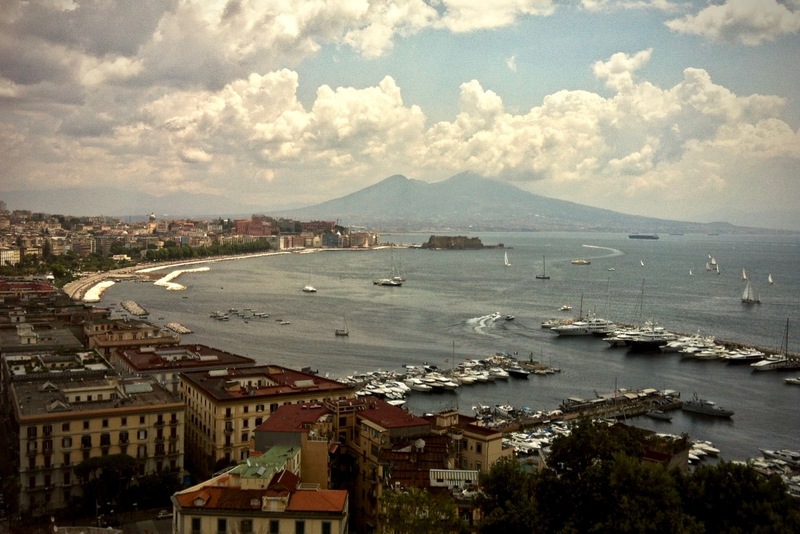 Naples is even closer to Rome than Florence, only an hour away by fast-train. For many, visiting Naples means just stopping there to get to Capri or Pompeii. But I love Naples and think it warrants a visit all on its own. As with Florence, I'd recommend either coming to Naples with a tour, or, having a plan for the day so you get the most out of it. I will be making a page about taking day trips from Rome to Naples. For now, check Napoli Unplugged for things to do. When to go: Year-round. Naples gets pretty crowded in December, because a lot of Italians come from all over to soak up the Christmas ambiance here, in particular the street where all the Nativity Scene objects are made and sold, Via San Gregorio Armeno. How to get there: Take the fast train from Rome to Naples. Do not drive! Tours: Most Naples day trips from Rome include Pompeii. If you only want to visit Naples, and you want a tour, take the train down, and book a local walking tour ($USD.) Click here to book in another currency. Is Venice an easy day trip from Rome? Not at all. But I get this question a lot, and it IS doable. The fast train takes about 3.5 hours to get from Rome to Venice, so a day trip means 7 hours of travel time. 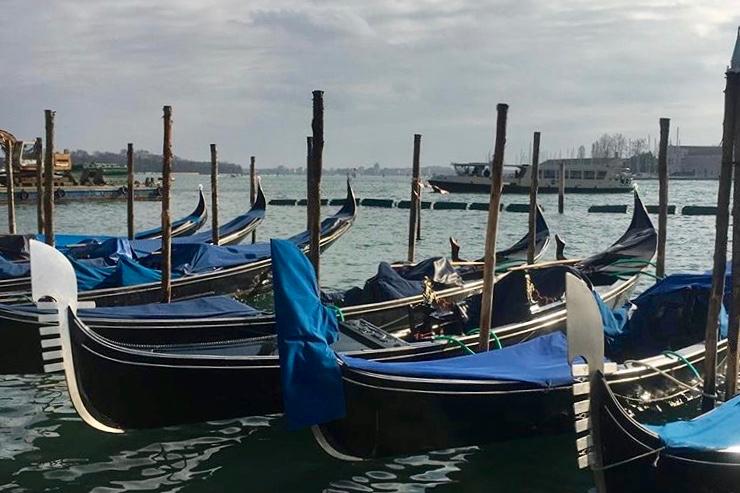 I've never taken a day trip to Venice from Rome, but my pal Gillian has, and here's how she did it. When to go: You can visit Venice any time of year. The quietest time is in winter (except for the Christmas and New Year holidays, and, of course, Carnival.) Venice can be really cold in winter, because it's right on the water. Most of the rest of the year is high season in Venice. Expect crowds. How to get there: Take the fast train from Rome to Venice. I strongly urge you not to consider driving. Tickets: If you want to see a specific museum or show, it's a good idea to purchase tickets in advance. Tours: You have several options for tours in Venice. You can book a day trip to/from Rome, or you can book a local tour for when you arrive ($USD.) Click here to book in another currency. A great resource on Venice, written by a local, is Monica Cesarato's blog. I hadn't thought about Bologna as being one of the best day trips from Rome, but now I think it's one of my favorites. The Neptune statue of Bologna is one of its most picturesque icons. But Bologna offers so much more! It's only 2 hours by train from Rome, so it's easy to get to. And it's a lovely place to just walk around. Bologna has a lot of water canals. Unlike Venice, the canals are under the city. This is the only canal in Bologna you can see, and you can spot it by visiting the "Finestrella di Via Piella". Many people consider the region of Emilia-Romagna (where Bologna is) to be THE food capital of Italy (parma ham, Parmesan cheese, Baslamic vineger, tortellini, etc.) As much as I love Roman food, I have to agree - one could die and go to heaven eating one's way through Bologna. Bologna is well known for its cuisine, in particular tortellini, and fettucine with "ragù", a meat sauce known outside of Italy as "Bolognese". Here is another local pasta, "gramigna", at Ristorante de Cesari. It may not be one of the most famous day trips from Rome, but if you want something different, try Bologna. Bologna is famous for its beautiful porticoes like this one. I love the morning light as it casts shadows through Bologna's porticoes. You can certainly go wine-tasting IN Rome. But if you want to make a day of it, and get out to the countryside, there are lots of options, from staying in the Lazio region (not far from Rome), to visiting Umbria or Tuscany. 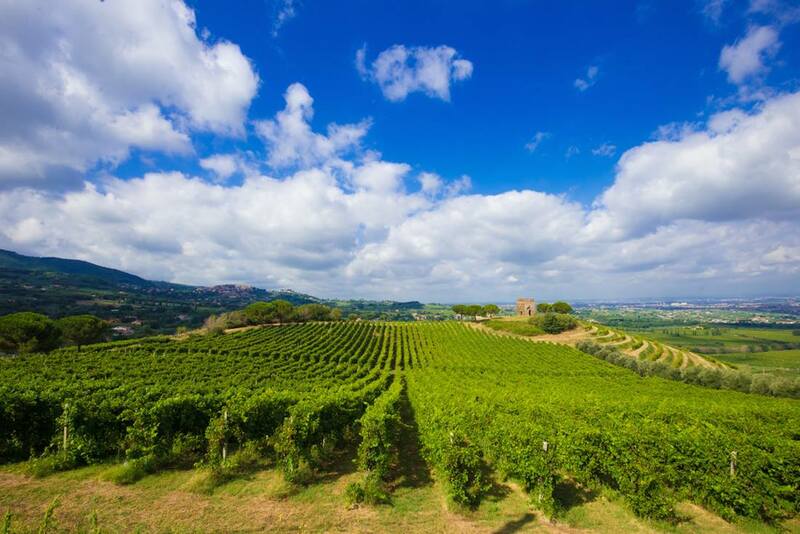 In my experience, the most popular wine-tasting day trips from Rome are in Tuscany. The region of Tuscany is just north-west of Lazio (Rome's region), and it's pretty easy to get to. When to go: Wine tasting day trips from Rome to Tuscany typically go from March through November. The wineries function in winter, but there is less demand and so tours don't tend to run then. How to get there: You could go by car, train or, taking a guided tour. If you go by train, you should pick a place where you know you can go wine-tasting, like Montepulciano. Frascati is only half hour from Rome, but it's like entering another world. A world of peace, quiet, elegance, and rolling hilltops...and wine. The ancient Romans knew what they were doing when they built their summer homes here to beat the heat. How to get there: It's simple to take the train from Rome right to Frascati. Regional trains leave from Termini, cost about 2€, and take 30 minutes one way. What to do: If you don't want to book an organized tour from Rome, check out this fantastic Frascati website by my pal Michelle Smith, who's lived in Frascati for years. She has a wealth of wine experiences listed on her site. Also, check out HeartRome's writeup of her day trip to Frascati. Tours: One of the things that makes Frascati one of the best day trips from Rome for wine-tasting is that you can even do this in half a day. Book your half-day tour here ($USD.) To book in Euro or other currencies, click here. Maybe one of the reasons you are interested in day trips from Rome is to get out of the big city. Rome is blessed in its proximity to other wonderful places to visit, not just the biggies like Pompeii and Florence. Orvieto is one of the loveliest day trips from Rome - an Etruscan era settlement turned into a medieval fortress and hideaway for Popes escaping sieges and sacks of Rome, this sweet Umbrian town makes a wonderful place to spend a fascinating day away from the hustle and bustle of the Eternal City. My dear friends Linda Martinez and Steve Brenner of the fabulous Beehive Hostel in Rome live in Orvieto. So I turned to Linda for suggestions about what to do. 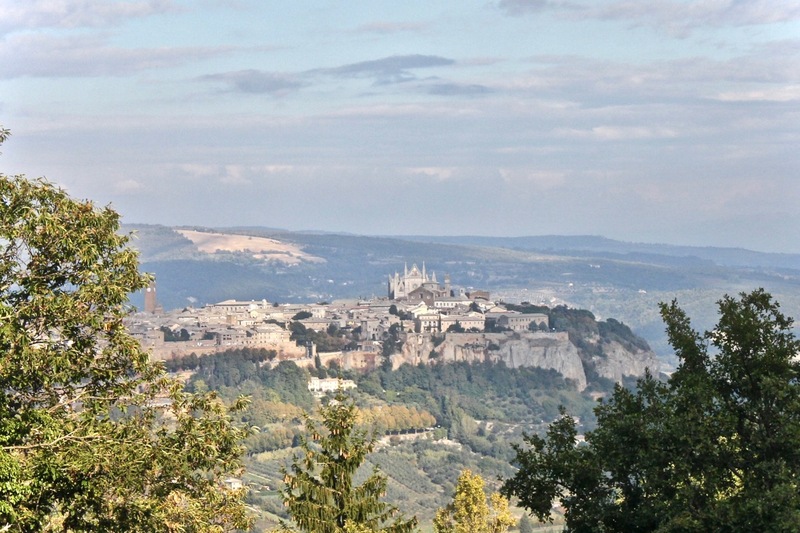 Here's her article "The Perfect Day in Orvieto." When to go: Year-round. The duomo (cathedral), the most important landmark in Orvieto, is open from November to February 7.30-13.00; March and October 7.30-18.30; From April to September 7.30-19.30. How to get there: You can easily travel between Orvieto and Rome via train. There are no fast trains, only regional or intercity. Tickets run between 7-18€ one way. It's about 1 - 1.5 hrs away. I adore the Umbrian town of Assisi. The birthplace of Saint Francis, it's got a magical, hushed feeling about it. Sitting high on a hill (as most Umbrian towns do, since in medieval times this was the best way to spot your enemies approaching), you get stunning views of the valleys below, whether from the church or a restaurant or just from walking through the narrow winding streets. When to go: You can visit Assisi year-round. The basilica is open daily. For specific hours and events, visit their website. How to get there: Take the train from Rome to Assisi. About 2 hours one way. Tours: If you go on your own, you can book a local tour in Assisi. Or, you can book a day trip from Rome to Assisi ($USD.) Click here to book in another currency. Without a doubt, one of the most moving day trips from Rome is a visit to Anzio/Nettuno. In WWII, the allies landed on Anzio beach. It was one of the most important and one of the bloodiest battles of the war. 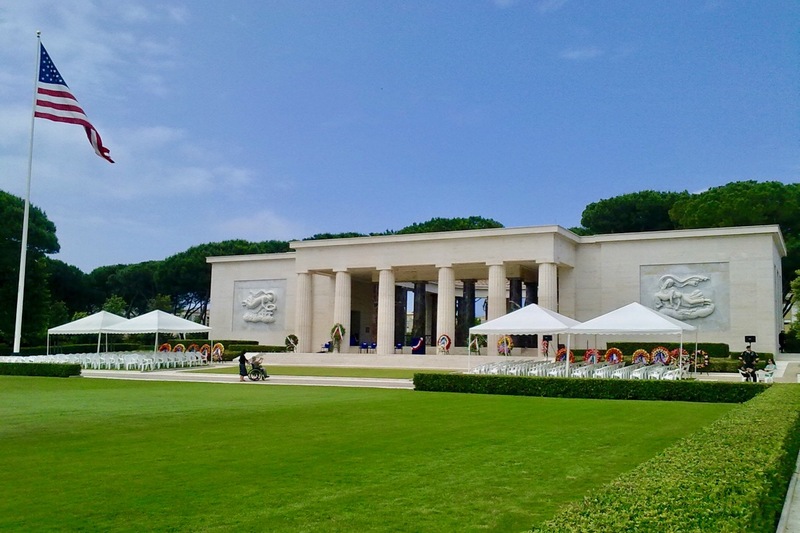 Today, Nettuno (so next-door to Anzio it's almost like a neighborhood even if it's actually a different town), is home to the American Cemetery for war dead. It's a beautiful, peaceful place, and can be a meaningful visit for those with relatives who fought in the war. Or for anyone really. You can also opt to book a full-day r/t day tour from Rome. When to go: The cemetery is open to the public daily from 9am to 5pm, non-stop, except on December 25 and January 1. How to get there: Take the train from Rome to Nettuno (about an hour.) Walk about 15 minutes to the cemetery from there. Bracciano is a small town on a lake, only about 20 miles north of Rome. 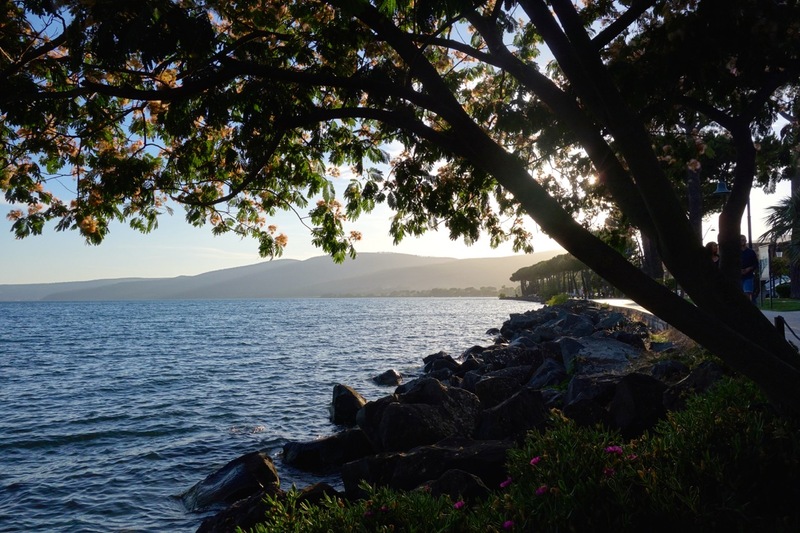 Lake Bracciano is a lovely place to spend a day not far from Rome. It's popular among Romans and tourists alike, for the quiet and pretty lake, and for the very well-preserved medieval castle that you can visit, Castello Orsini-Odescalchi. A lovely day trip or even half-day trip from Rome. When to go: You can visit Bracciano year-round, but it's most pleasant in the spring-through-fall months. How to get there: Take the train from Rome to Bracciano. It's about 1 hour away. 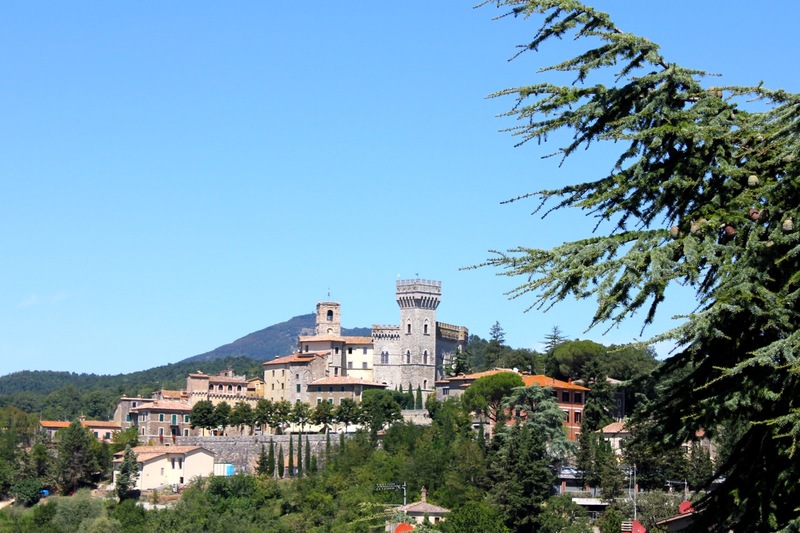 Tours: Book a half-day lunch+castle visit day trip to Bracciano from Rome. Or, take a full-day trip from Rome to the towns around the Bracciano lake, which includes a visit to the castle, lunch, and some other towns to boot! I have been surprised over the years to hear many people say they'd like to take a day trip from Rome to Cinque Terre. This seemed just impossible to me. It's far and not easy to get there. But now, one tour company is actually doing this, and they've made it "relatively" easy! Cinque Terre. Photo by Diana Simon of Browsing Italy. 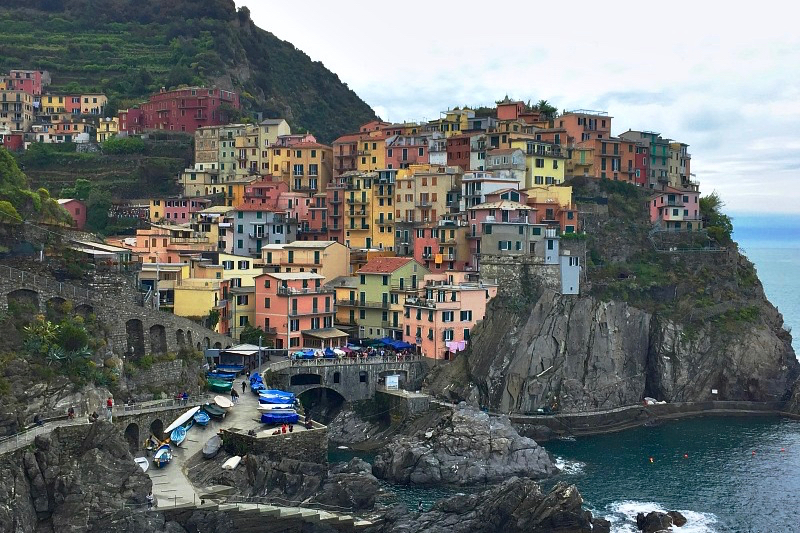 My friend Diana Simon of Browsing Italy just wrote about the experience of taking a full-day trip from Rome to Cinque Terre. You can read it here. When to go: You can visit Cinque Terre year-round. In low season (late November - early March), you will find limited services. How to get there: If you really want to try to get to Cinque Terre on your own, as a day trip from Rome, you'll need to study the train schedules. First you need to take a train to La Spezia. From there, you'll have to get a local train or bus to one of the towns you want to visit. 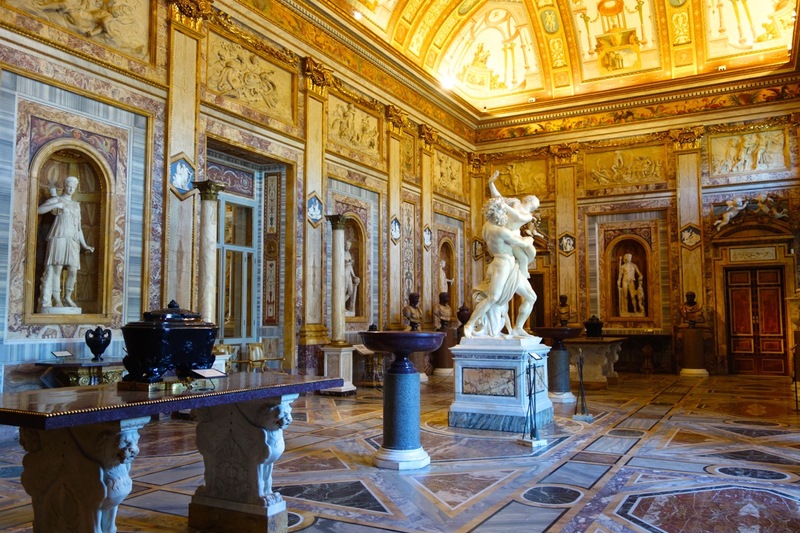 Tours: In my opinion, this is one of those day trips from Rome that really warrants letting someone else do the organizing for you (read Diana's description above!) You will have to get up very early, but it will be a fabulous day, with plenty of adventure but also enough downtime to make it relaxing! Click here to book your day trip to Cinque Terre from Rome. We have some beautiful gardens in Rome (like at the Vatican!) And there are the Villa Borghese and other parks. And of course the sweet Roseto Rose garden that opens only in May. But just outside of Rome are some unique, specially curated gardens that are a must for anyone who loves extraordinary landscaping, or for anyone looking for some greener, quieter day trips from Rome. When people think of visiting Tivoli, it's usually to visit the Villa D'Este, a Renaissance nobleman's villa with one of the most stunning gardens in Italy. A UNESCO world heritage site, Villa D'Este and the gardens are just one of the wonderful things you can visit on a day trip to the town of Tivoli from Rome. There is also the villa Gregoriana, and, if you are up for a delightful and not too-expensive meal, a lunch at the centuries old restaurant, Sibilla. And, if you want to include the Villa Adriana (Hadrian's Villa), you can try for that too, although it's a bit out of the town and harder to get to. When to go: While you can visit Villa D'Este year-round, it's most magical when the plants and flowers are in full bloom. The villa is closed Mondays, January 1st, May 1st, and December 25th. If Monday is a holiday, the monument will remain open and the weekly closure will then be delayed until the following business day. How to get there: It's easy to get to the town of Tivoli and from there, to the villa. You can take a bus or train r/t from Tiburtina station in Rome. About 50 minutes. 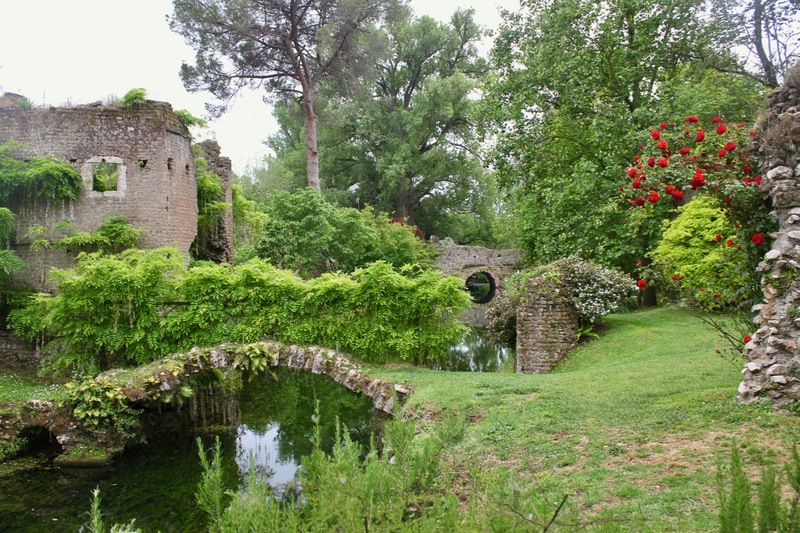 Not far from Rome, the Gardens of Ninfa are an oasis of beauty and peace. Once a Roman settlement, then a medieval village, the gardens today are almost bursting with plants and flowers from all over the world, in what they call "organized chaos." The ruins, the walkways, and the extraordinary and surprising beauty of this mix of species living in harmony all create an almost magical, hushed ambiance that seems to be another world away from Rome. When to go: The Gardens of Ninfa are one of the most difficult day trips from Rome to organize. They are open on weekends only from April through November, but from July, they are only open once a month. You need to book long in advance as they limit the number of visitors, to protect the delicate environment. How to get there: If you go on your own, take the train from Rome to Latina. From the Latina station, you can take a taxi (5 minutes), or a shuttle bus. The schedule is on their website. Tickets: If you go on your own, you'll need to reserve tickets long in advance. 12€ for adults. Here is the official website. Whether you book on your own or through a tour company (below), you have to visit the gardens with a guide. It takes a little over an hour. Tours: Click here to book a full day tour to Ninfa from Rome, which includes lunch, a tour and R/T transportation. Ostia is the closet beach to Rome, only about half an hour by train. Ostia beach, easily reachable from Rome. Head over to this page if you want to know about my favorite beaches near Rome. When to go: You can go to the beach at Ostia any time of year. There are always one or two restaurants open on the beach even in winter. How to get there: The easiest way to get to Ostia is by train. Take the metro B to piramide, and then change to the train going to Ostia (it's the same ticket as the metro, so you don't have to buy a new ticket.) Get off at Ostia Lido Centro. 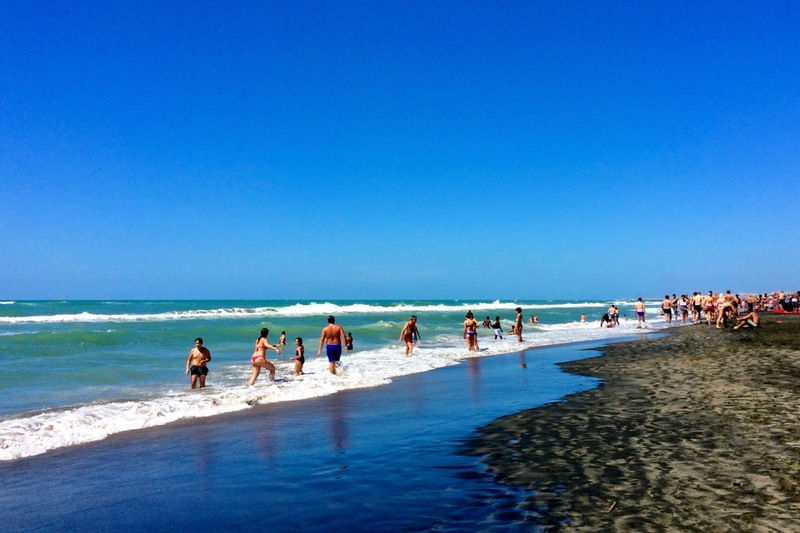 Ostia is the easiest of the beach day trips from Rome. If you want a special beach day trip from Rome, head to magical Capri. It's more ideal as an overnight visit, but it IS doable in a day. My pal Gillian is a Capri expert. She doesn't yet have a page about a day trip to Capri, but here's her post about 36 hours there. You can adjust for your day trip! When to go: You can visit the island of Capri year-round. But October and mid-March, there are limited services available. This includes hotels, restaurants and even transport to/from the island. How to get there: Take the train to Naples. From there, get a taxi to the dock. From there, you can take several different boats, from a high-speed hydrofoil to a slightly slower and larger ferry. Travel times between Naples and Capri are between 50-90 minutes depending on the boat you take. Or, you can take a speedboat and get there super fast! Tours: Consider taking a full-day tour from Rome to Capri that takes the guessing about train + ferry schedules out of the picture. Want another option for beach day trips from Rome? I look to my friend Gillian as the expert on island day trips from Rome. Check out Ponza! It's a small island group pretty close to Rome. You can have a relaxing quiet trip and cool off to boot! When to go: As with any beach trip, you can visit year-round but expect limited services and things open in winter. And of course it is not beach weather until summer, but you can still go and enjoy the scenery. 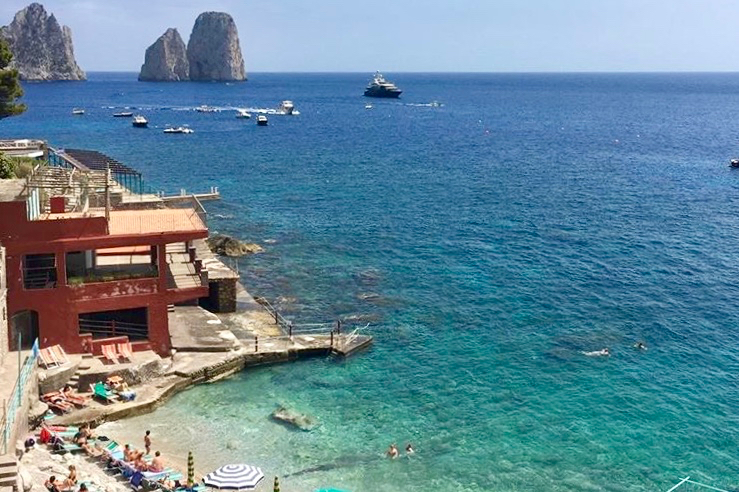 Tours: There is a full-day tour to Ponza from Rome, which is the easiest way to go especially if you are on vacation ad have limited time to deal with train and ferry schedules. 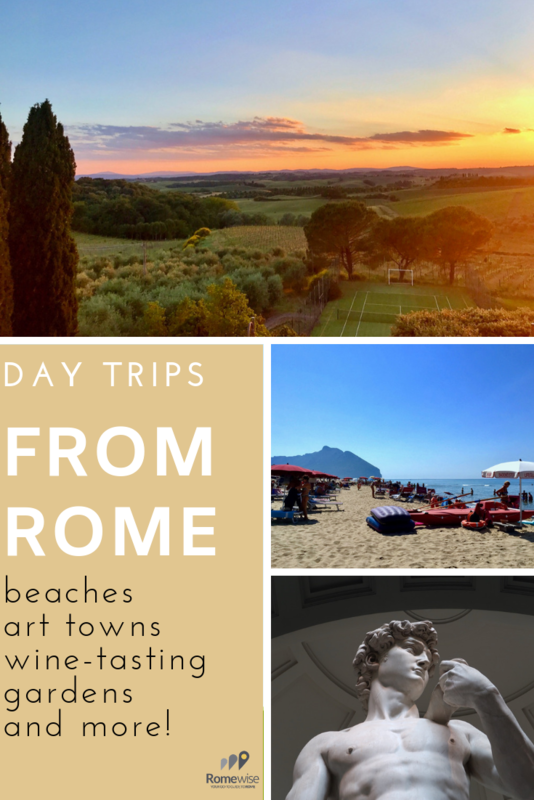 There are lots of beaches near Rome and these make for great day trips from Rome in summer, or really any time. Sabaudia beach, with Monte Circeo in the background, is one of the loveliest beach day trips from Rome, but also one of the most complicated if you don't have a car. 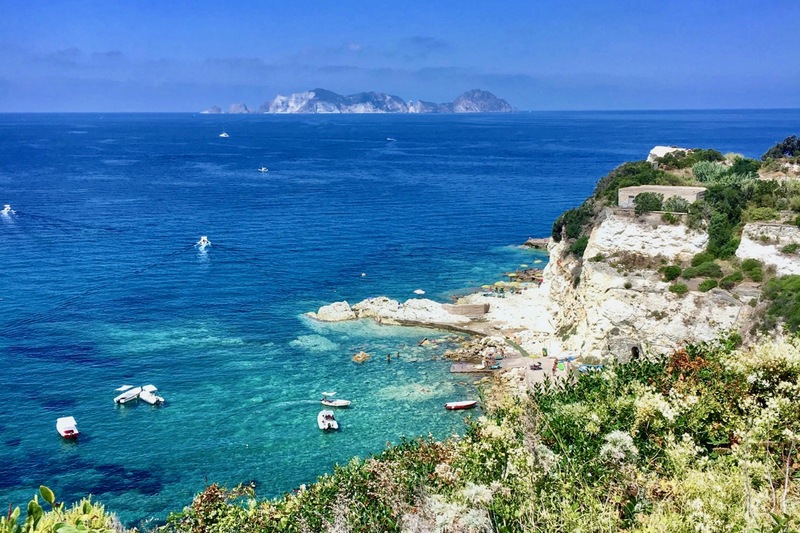 Here's my round-up of my favorite beaches near Rome, and how to get there.